At this point I shouldn't need to put a disclaimer for spoilers from the previous movie and YuYuYu, but, there I guess. One more thing, pay attention to the characters, there are characterizations there as always. To give a short summary of this movie, the triad get a well deserved rest. After taking out 4 vertexes and lots of intensive training, they go on a vacation for a bit. This vacation from being heroes is very comparable to the first half of YuYuYu episodes, characterization through their interaction. Story 7: The story in this movie is, as mentioned above, about the characters. It does not advance the plot much; but it does some, and where it does, it does it well. Art 9: The art and animation is mostly what you expect at this point from this series, it's really good. There was one place that they used 3D GC for full character animation, and I understand why they did it. But it wasn't done too well, I'm not really that against 3D animation as long as it looks nice, but this was pretty choppy. Keep in mind they have done character animation in 3D before, just from far away, so my eyes may be deceiving me. Either way I know they are capable of more, hence I didn't give a 10. Still, the backgrounds were very pretty, even being out of the dreamlike world of Jukai for most the movie. It honestly impressed me how well they did the sunset lit sky (I live in a place with pretty good sunsets). They looked rather natural, but still beautiful, a hard balance to pull off. Sound 9: This is better than the first movie in my eyes. The music was new from what I could tell during the most of the movie. It was good and went along with the scene very well. The opening and ending were great. It just didn't have any music that stuck with me too much. There's also an amazing sound effect that shows up twice if I'm not mistaken, it has to be the best character being surprised sound I've ever heard. Character 9: The characters remind us that, even if they were picked and prepared for this duty, they are still children. They like to play around like children, they get scolded like children, and they get excited like children. On top of that we got more depth into the characters. Lastly we get to see the characters grow closer together, which is always a nice thing. Enjoyment 9: As a fan of the cute girls doing cute things genre It's natural that I would enjoy just that. This was a really fun one, it had me smiling from cheek to cheek, laughing a lot too. The scene in Jukai was really good too. I just had a really good time watching this, it was fun, funny, and a bit heart racing during the action. It was just a great time overall! Overall 9: See directly above. It's a curious thing, being the 2nd in a trilogy. Too often they get overshadowed as the "middle" chapter, sandwiched between a grand opening and a grand finale with only exposition as its purpose (Lord of the Rings), but sometimes the journey, the character shaping movements and setup for the finale are the strongest elements (Empire Strikes Back). Washio Sumi's 2nd chapter, Spirit, is already leaning toward the latter. Following the friendship cemented at the end of the first movie, the second movie delves deeper into those bonds. Amusingly, it uses an omake-styled skit setting for the opening half's slice-of-life, giving us a fast-paced omnibus of character development, world-building and most importantly, juxtaposition, as the girls have a cutesy Vertex-free Summer to figure out who they are. The universe of Yuki Yuna means that, at any point, the characters can be expected to be thrust into battle at the drop of a hat, indicated by the world's motion halting except for the main characters. This small ingredient makes the entire series' slice-of-life sequences incredibly tense, forcing you to watch the backgrounds for pauses. Watching the skits sections of this movie is incredibly stomach lurching, as you know at any point their world can be flipped upside down. The movie isn't exactly subtle about what's to come, with very in-face foreshadowing. In fact, almost every skit can be considered as foreshadowing, either for later in the movie or the next one. But, despite all that preparation, it's hard to be ready for the finale. The original series always put the girls on the backfoot, and while Washio Sumi's chapter is no different, it's more like they are on their last toe before they even start. The odds are even more stacked than ever before, and the brutality is even greater. It gets real dark, real quick. Barring one or two of the skits flopping in the first half, Spirit is the finest moment of the Yuki Yuna franchise thus far, usurping the first movie with stronger characterisation and capturing the unique sorrow of Sailor Moon meets Hurt Locker only this universe can bring. Can the third movie do better still? 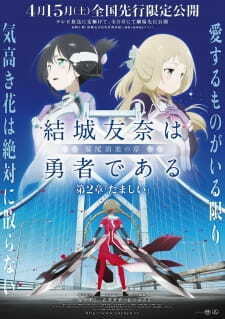 Coming chronologically after the first Washio Sumi no Shou movie, this movie is the second in a triad of three movies. As opposed to the first movie which had quite a bit of action scenes, the main focus of this movie is actually detailed characterization so you can expect a minimal amount of action scenes. Initially, the first few events from this movie led me to believe that this movie would, in essence, amount to a mediocre filler, but I was wrong. This second movie has an abundance of great characterization that is reminiscent of the gloriously characterized anime of the days of old. The story was pretty interesting overall. This time, the focus veers away from the magical girl theme and we begin to learn more about the characters themselves through the story. Throughout the movie, we learn of their hopes and dreams for the future, we watch their lively responses in ordinary situations, we see how silly they actually are in ordinary life, how they joke around and tease each other, are protective one another, and much more. I found it to be a great slice of life movie, to the point where the story was actually good enough for me to get slightly emotional in this movie, which seldom happens for me in anime. The good story was only further enhanced by the great artwork of Studio Gokumi. Studio Gokumi did a really great job on the artwork in this second movie. It starts off strongly with an action practice scene with some very fluid animation, before then presenting it with a bright appeal that was well-suited to the slice of life vibe of this movie. They created a very light hearted mood by using a blend of bright colors that is supported by artistic and dynamic effects, lighting, shading, and camera angles. The background art is nothing too special, but it also has a certain simplistic charm to it. Overall, the artwork was done quite well, but there was certainly room for improvement (especially that one 3DCG scene that had me shaking my head at how noticeable the 3DCG was). Luckily, with the aid of the fantastic musical compositions of the composers of the nier automata soundtrack, the movie certainly did not have to compensate for mediocre sound. Like the first movie, the second movie’s soundtrack was also composed by Keiichi Okabe and Keigo Hoashi. These two are most recently well-known for their work on the Nier Automata game’s soundtrack. Overall, the music was great, using much of the same music from the first movie. Also, the voice actresses did a great job on the voice acting in this movie. They held were just as good as the other categories and perfectly supported the other categories. The sound effects guys also did a great job by themselves and had some really great effects to support the comedic scenes. This film is pretty much all about Gin, and there's a very, very good reason for that at the end. Because Gin needed to be developed beyond a simpleton "nekketsu" Hero, the novelist gave her a big loving family, and a heart of pure gold-- she's late to school because she helps anyone in need that she comes across. You can't help but smile when Sumi and Sonoko find out why she's always late to class. The plot is broken up in film 2 with side stories. I understand why they did this (they're hilarious, and they need to fill up time), and I feel of two minds about it. Usually I'm not thrilled with the plot going in weird directions, but I can give it a pass because Sonoko is funny. Thankfully, the editors didn't go too crazy here. There wasn't much tear-jerking in film 1, so they made up for it in a big way in film 2. Grab your tissues. Fans of the series already know what happens at this point, and the film does foreshadow the ending (anime fans call it "flagging").